Rarely do I wake up and crave a good bowl of tonkotsu ramen, but today was different. 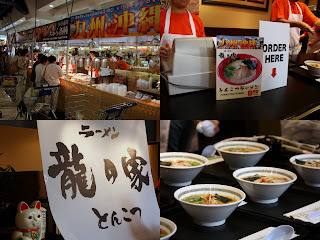 Tatsunoya is in town for the Kyushu & Okinawa Festival at Mitsuwa Torrance and I hear their ramen is "BOMB!" Straight out of Kyushu (Kurume to be exact), Tatsunoya's ramen has been influenced by both Hakata and Kurume styles. (If you want to know more, check out Nate's blog.) Normally, there are two ramen on the menu, but this weekend's fair only showcases the Koku-aji as opposed to the Assari. Unfortunately, the Torokeru Pudding didn't make the trip either. Okay, so it may not be exactly like how it's served in Japan, but Tatsunoya's tonkotsu ramen was indeed ticking. Every sip of the smooth, salty, pork bone soup brought my tastebuds closer to exploding. Mixing up the special miso paste into the soup provided a much bigger bang that tingled my tongue and massaged my inner cheeks. The chashu was interestingly hard on the edges, but very moist in the center. The contrast initially pinched my eyebrows together, but then it led to an understanding smirk. The noodles were typical Hakata/Kurume style straight & thin. Although the ramen was BOMB, these special flan-stuffed-cream-puffs from Kikuya were amazingly good. Seriously, don't miss out on these either! Hola Dios te bendiga y prospere la obra de tus manos. @rameniac: real bowls AND real spoons! rad man, glad you enjoyed it! sounds like they did it up proper for the americanos. Loved it! :) Great writeup and I'm glad I was able to try it as well before they're gone. I tried the Tatsunoya Ramen on thursday late afternoon and my headache carried along till friday afternoon ! It must be the excessive salt and MSG thats already part of the soup base - I had asked for "low salt" but was told "can't do". Despite the excessive salt+msg, it did taste good but it will be something that I can only eat once a month. Sadly, tonight my sister is taking me there again cuz she missed it last thursday.